位于肌、腱、关节、皮肤内。 Muscular, tendon, joint, skin. 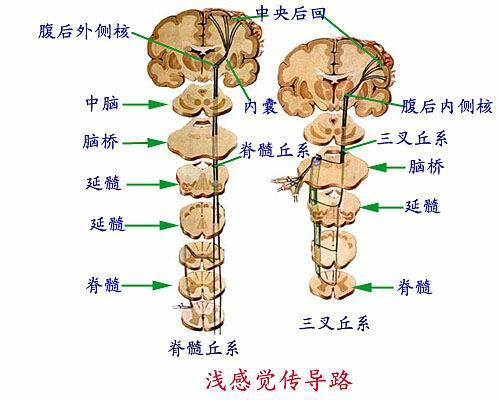 胞体位于脊神经节内,为假单极神经元。 Cell bodies located in the spinal ganglia, as Pseudounipolar neuron. 其周围突布于感受器内，中枢突经后根进入脊髓后索上行为薄束和楔束，终于薄束核和楔束核。 Sudden cloth around within receptors, central processes after the root into the spinal cord on the behavior of thin beam and wedge beam, and finally a thin wedge nucleus and nucleus. 胞体位于薄束核和楔束核。 Soma located gracile nucleus and nucleus wedge. 其纤维交叉后组成内侧丘系，终于背侧丘脑腹后核。 Its constituent fibers cross medial lemniscus finally dorsal thalamic nucleus belly. 胞体位于背侧丘脑腹后核，其纤维经内囊投射到大脑皮质感觉中枢。 After the cell body is located in the dorsal thalamus ventral nucleus, the fiber through the internal capsule to the cerebral cortex sensorium projected. 位于皮肤内。 Located in the skin. 胞体位于脊神经节内,为假单极神经元。 Cell bodies located in the spinal ganglia, as Pseudounipolar neuron. 其周围突布于感受器内，中枢突经后根进入脊髓后角。 Sudden cloth around within receptors, central processes after the root into the spinal dorsal horn. 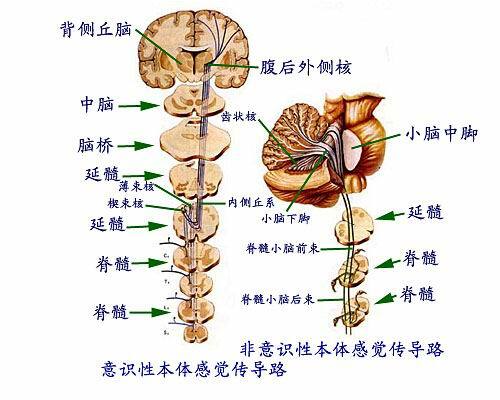 胞体位于脊髓后角。 Located in spinal dorsal horn cell body. 其纤维斜升1~2个脊髓节段交叉至对侧上行为脊髓丘脑束，经脑干终于背侧丘脑腹后核。 Its fiber ramp 1 to 2 spinal segments cross to the contralateral spinothalamic tract on behavior, and finally through the dorsal thalamus ventral brainstem nuclei after.